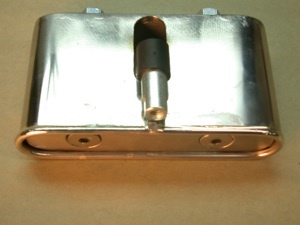 This article will show you how to build a custom hidden door handle with a manual opener. 1. We started by making a buck that will hold the bushing sliders in place for the right and left door. We used 1/2 o.d. thin-wall stainless tubing and installed bronze bushings. And we made our bottom plate from 16 gauge stainless steel to keep them in place. 2. Here we soldered the bushing sliders to the plate and then bent a piece of 20 gauge stainless steel to match the slider plate shape for the outer door handle body. 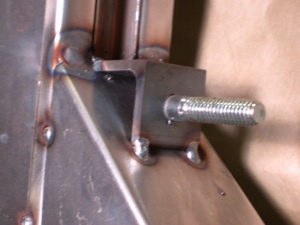 And then welded the seam. 3. Here you can see the other plate (red arrow) that will be used for our top section push plate. This is 1/8th smaller than our bushing plate to allow smooth movement inside the shell. 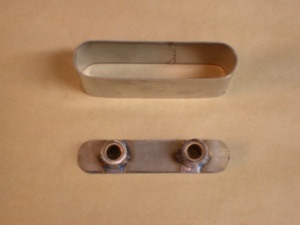 And we bent the 1/8th stainless rod to the bushing plate shape and soldered it onto the handle body to protect the user´s fingers. 4. 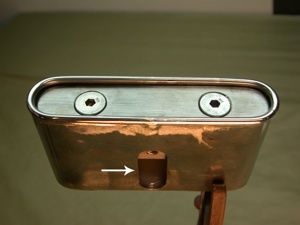 This picture is a close up of the inside of our hidden handle. 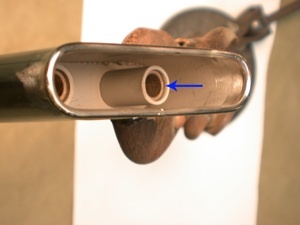 Notice the step where the bronze bushing is below the edge of our stainless tubing (blue arrow). 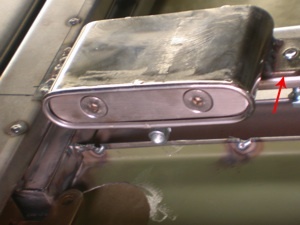 This step allows the spring shown in step #5 to stay in place under pressure. 5. Here we added a threaded tab (blue arrow) to hold a linkage rod and counter sunk the stainless push plate for the retainer screws. We used two ¼ I.D. springs to fit over the thin wall tubing, which fit over the ¼ - 20 screws. 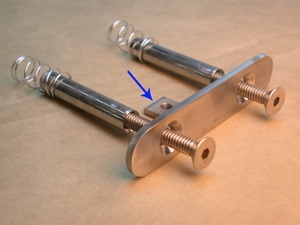 This will allow a plunger action for the slider mechanism. Pretty basic but it will stand up to repeated openings of the door. 6. Next we built a rod retainer. 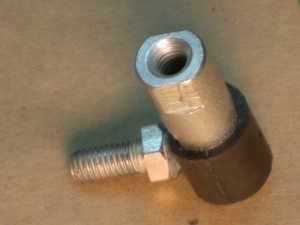 This is the bottom of a 10/24 rod cut off with a small ½ long ½ bolt welded to it. This bolt will be screwed into the tab we made in step #5, after the push plate is installed in to the handle body. 7. Here is the finished assembly. As you can see, the plate is flush with the wire rod. Notice the slot on the bottom of the handle body (white arrow). This allows ample movement for the linkage built in steps #5 and #6. 8. And here we attached the rod retainer and are now ready to install the handle on the door. 9. 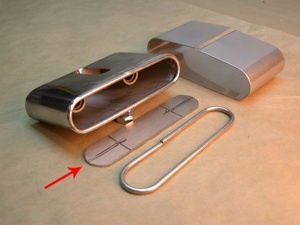 Here we added a tab on one side (red arrow) and simply welded the opposite side to the door channel to secure the body. 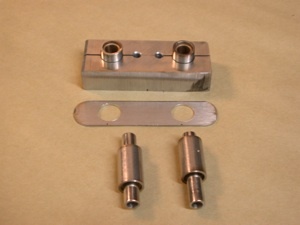 We are now ready to attach the linkage and see how the handle works. 10. 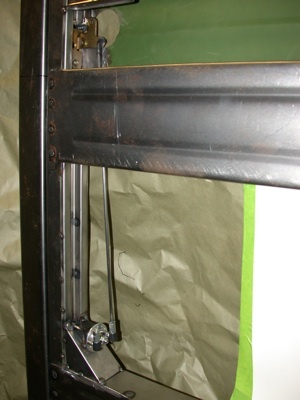 Here we attached a small angle bracket with a stud to the bottom of the door beam to hold our linkage wheel. 11. 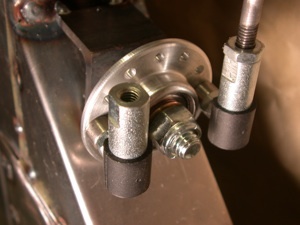 Then we installed a linkage wheel, using a set of thrust washer style bearings, and installed two rod retainers. 13. And here is the door with one linkage rod installed. The other rod will be attached to the door latch.